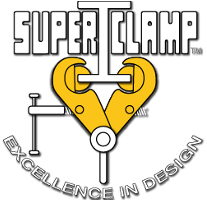 The SuperClamp Trade Mark is synonymous with Excellence in practical design, effective safety and assured quality control. SuperClamp™ products are engineered with the aim to provide safety, efficiency and durability. These guidelines are designed specifically to ensure the proper inspection and safe usage of SuperClamp products. This article also includes information on the minimum radius for runway beam trolleys and reduction in working load limits when side loads.